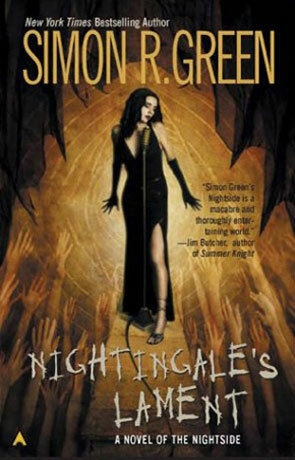 Nightingale’s Lament is a novel in the Nightside series by Simon R Green. The Nightside occupies the same space but in another dimension as London does. To travel there one must know the correct portals. John Taylor lived in Nightside all his life until it was discovered that his mother was not human. She disappeared shortly thereafter and his father died a few months later. John had no protection from the Others who wanted him dead. He went to London and became a private eye, but a case brought him back to Nightside where he has resided ever since. His third eye allows him to locate anyone or anything in the city where creatures of myths live side by side with humans. He continues to be a paid private investigator. His latest case involves singer Rossignal the Nightingale who is playing at the Caliban’s Cavern Club. Her melancholy songs has caused people to commit suicide. Her managers controls her which makes John want to free Rossignal from her gilded cage. Though this is Simon R, Green’s incredible world, the Nightside is not a very green location as this unique place centers on good and evil’s constant battle for supremacy. The hero fights on the side of the light as he tries to expel the darkness out of existence John seems in a never-ending story with only his curiosity about his mother occasionally diverting him from his goal. In his latest caper, John is in top gun form as the latest skirmish with the cretins of the dark will leave him dead if he fails to free the Nightingale for running is no longer an option. Written on 4th March 2004 by TC.